The so-called zero-lower-bound (ZLB) plays a prominent role in modern (and even older) macroeconomic theories. It is often introduced in a paper or at conference as a fact of life -- an unavoidable property of the physical environment, like gravity. But is it correct to view it in this way? Or is the ZLB better thought of as legal constraint--something that can potentially be circumvented by policy? Balances maintained at a Federal Reserve bank by or on behalf of a depository institution may receive earnings to be paid by the Federal Reserve bank at least once each calendar quarter, at a rate or rates not to exceed the general level of short-term interest rates. The effective date of this authority was advanced to October 1, 2008, by the Emergency Economic Stabilization Act of 2008. It is not clear (to me, at least) whether the Act grants the Fed the authority to pay a negative interest rate on reserves. Note that if the interest-on-reserves (IOR) rate is set to a negative number, then banks would in effect be paying the Fed a "service fee" for the privilege of holding reserve balances with the Fed. 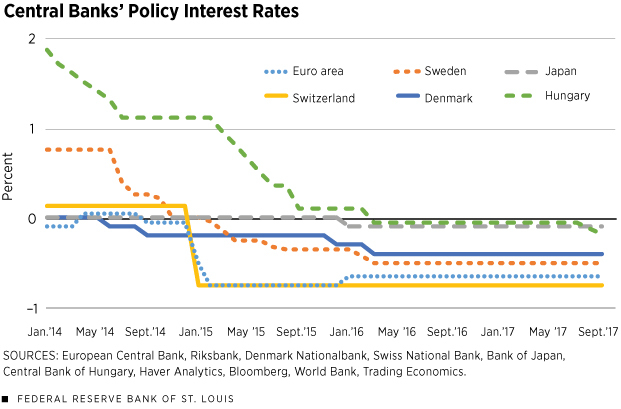 But if the Fed is not legally permitted to use negative interest rate policy (NIRP), then the ZLB is obviously a legal constraint. Arbitrage between money and bonds requires nominal interest to be positive. This "zero bound" constraint gives rise to a macroeconomic situation known as a liquidity trap. It presents a difficult challenge for stabilization policy. There is currently over $10 trillion of government debt in the world yielding a negative nominal interest rate; see here. As of this writing, even long bonds like the German 10-year Bund are in negative territory. Well, alright, so the ZLB is evidently not an economic constraint. But surely there is some limit to how low nominal interest rates can fall? This lower limit is called the effective lower bound (ELB). And economic theory is clear: if we're at the ELB in a recession, then monetary policy has done about as much as it can be expected to do. But what exactly is the ELB? Is it -1%, -2%, -5%, or perhaps even lower? Economists like Miles Kimball believe it to sufficiently negative to warrant NIRP as an effective policy tool; see here (see also the discussion by Ken Rogoff in chapter 10 of his book). These arguments, however, did not seem to gain much traction. 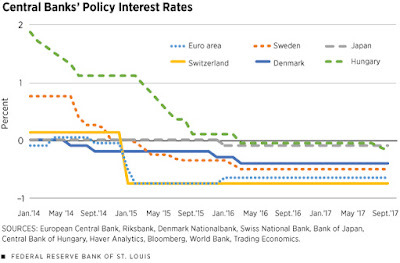 For example, in the present discussions concerning the Fed's new long-run monetary policy framework, the possibility of NIRP is not even mentioned. But perhaps it should be if the ELB is in fact significantly below zero. In what follows, I want to make my own (related) argument for why the ELB is probably a lot lower than most people think. Suppose the Fed was to set the IOR to -10% (in a deep demand-driven recession, this would presumably be accompanied with a promise to raise the IOR at some point in the future). The traditional economic argument suggests that any security dominated in rate of return by cash would in this case be driven out of circulation. That's about the size of a football field. Banks would not convert all of their reserves into cash--even if it was costless to do so--because they'd need about $20-30 billion or so to make interbank payments. Of course, managing all that cash would be far from costless. But there is a simpler reason for why banks would not make the conversion. The Fed could simply charge banks a 10% service fee on their vault cash. Alright, well what effect is the -10% IOR rate going to have on the deposit rate (or fees) that banks offer (or charge) their depositors? Banks are not likely to pass the full cost on to their depositors, especially if they view the NIRP to be temporary, because they'll want to maintain their customer relationships. But let us take the extreme case and suppose that NIRP is perceived to be permanent. Then surely deposit rates will decline (or bank fees will rise) significantly. Deposit rates may even decline to the point where depositors start withdrawing their money from the banking system. Banks may well let this source of funding go if they could borrow more cheaply from the Fed (banks would need to borrow reserves to honor the withdrawal requests of their customers). Of course, the Fed lending rate is also a policy variable and could, in principle, be lowered to negative territory as well. But how realistic is it to imagine all or most bank deposits converted to cash? While this might be the case for small value accounts, it seems unlikely that the business sector would be able to manage its payments needs without the aid of the banking system. Even money market funds need to work through the banking system. I suppose one could imagine a new product created by (say) Vanguard in which they create a cash fund with equity shares redeemable for cash that is collected and stored in rented Las Vegas vault. But the moment the activity is intermediated, it becomes taxable. If the Fed is not permitted to tax (oops, charge a service fee) such entities, the fiscal authority could, in principle, implement a surcharge that is set automatically off the IOR rate in some manner. I think in this way one can see how the ELB might easily be well below -5% (or more). This is probably low enough to allow us to disregard the ELB as a binding economic constraint. The relevant constraint is always a legal one. And laws can be changed if it is deemed to serve the public interest. Keep in mind that in a large class of economic models, ranging from Keynes (1936) to New Keynesian, there is potentially much to be gained by eliminating the ZLB. If these models are wrong, then let's get rid of them. But if they're roughly correct, why don't we take their policy prescriptions seriously? Let's stop talking about the ZLB as if it's a force of nature. It is a policy choice. And if it's a bad policy choice, it should be changed. Question A: Countries that borrow in their own currency should not worry about government deficits because they can always create money to finance their debt. Question B: Countries that borrow in their own currency can finance as much real government spending as they want by creating money. as if the the two statements constitute some core belief of MMT. Was any MMT proponent included in the survey? Don't be ridiculous, of course not (there were a couple from MIT though--perhaps they thought this was close enough). How would a typical MMT proponent have answered these two questions? I am sure that most would have answered in the exact same way as other economists. If this is the case, then why does Chicago Booth preface the survey with MMT? There are many possibilities, none of which are attractive for Chicago Booth. Let's consider Question B first. Or, better yet, let's not. This question is so ridiculous it hardly merits a response. Nobody believes that governments face no resource constraints. O.K., so let's consider Question A, where some legitimate confusion may be present. Before I start though, I want to make clear that I don't purport to know the entire MMT academic literature very well. But I have done some reading and I have corresponded with some very smart, very thoughtful MMT proponents. I don't agree with many of their views, but I think I see how some of what they say is both valid and contrary to conventional thinking. At the very least, it seems worth exploring. What I am about to say is my own interpretation -- I am not speaking on behalf of MMTers. Alright, so on to the question of whether deficits "matter." The more precise MMT statement reads more like this "A country that issues debt denominated in its own currency operating in a flexible exchange rate regime need not worry about defaulting in technical terms on its outstanding debt." That is, the U.S. government can always print money to pay for its maturing debt. That's because U.S. Treasury securities represent claims for U.S. dollars, and the government can (if it wants) print all the dollars it needs. Nobody disagrees with this statement. MMTers like to make it explicit because, first, much of the general public does not understand this basic fact, and second, this misunderstanding is sometimes (perhaps often) used to promote particular ideological views on the "proper" role of government. Mainstream economists, like myself, like to point out what matters is not technical default but economic "default." An unexpected inflation whittles away the purchasing power of those caught holding old money as new money is printed to pay for whatever. I think it's clear that MMTers understand this too. This can be seen in their constant reference to an "inflation constraint" as defining the economic limits to government spending. I tried to formalize this idea in my previous blog post; see here: Sustainable Deficits. But it's more complicated than this -- and in interesting ways, I think. Consider a large corporation, like General Motors. GM issues both debt and equity. The debt GM issues is denominated in dollars, so it can go bankrupt. But GM also issues a form of "money"--that is, is can use newly created equity to pay its employees or to make acquisitions. Issuing more equity does not expose GM to greater default risk. Indeed, it may very well reduce it if the equity is used to buy back GM debt. If GM is thinking about financing an acquisition through new equity issuance, the discussion is not going to about whether GM can afford to print the new shares. Of course it can print all the shares it wants. The question is whether the acquisition is accretive or dilutive. If the former, then issuing new money will make the value of GM money go up. If the latter, then the new share issue will be inflationary (the purchasing power of GM shares will go down). In other words, "deficits don't matter" in the sense that the outstanding GM liabilities do not matter per se -- what matters is something more fundamental. Equity "over-issue" may not be desirable, but the phenomenon is symptomatic, not causal. The U.S. government and Federal Reserve in effect issue equity. The government need not default on its debt. This is because U.S. Treasury debt is convertible into money (equity) and the Fed can do so if it so chooses. The question for the government, as with GM, is whether any new spending program is accretive or dilutive. If the economy is operating at less than full capacity, then this is like GM being presented with a positive NPV investment opportunity. 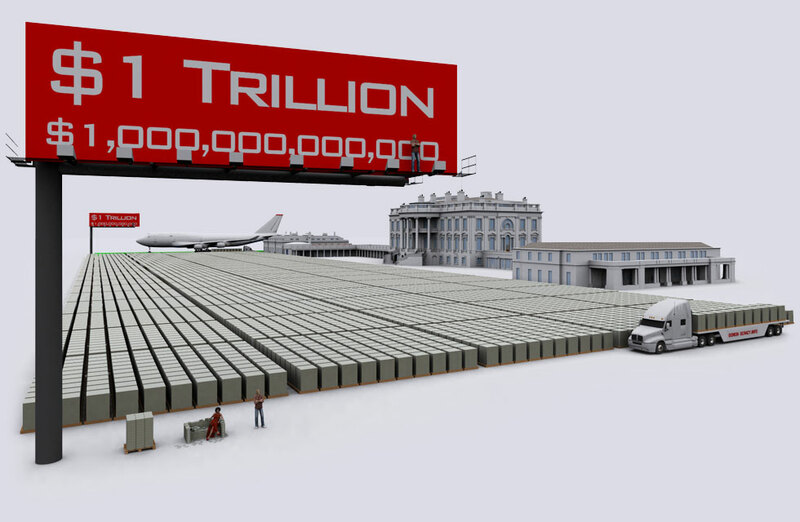 The government can issue new money that, if used wisely, need not be inflationary. There are limits to how far this can go, of course. And there was the all important qualifier "if used wisely." But this is exactly where the debate should be: how should our institutions be designed to promote the "best" allocation of resources? I often hear that MMTers don't have a good theory of inflation. As if there is a good theory of inflation out there already. But I see in MMT a theory of inflation that overlaps (not entirely) with my own views expressed, say, here: The Failure to Inflate Japan. The MMT view seems to take a broader view over the set of instruments that monetary policy may employ to control inflation. We can have a debate about the merits of their views, but there's no reason to dismiss them outright or to pretend they don't have a theory of inflation. Another complaint I hear: the MMTers don't want to produce a model. You know, it's true, there are not many mathematical models out there. So what? First, the lingua franca of policy making is English -- math is a part of a trade language. Economic ideas can be understood when expressed in the vernacular. It's also been helpful to me and others to attempt to "formalize" our thoughts in our trade language. But it seems to me that some of my colleagues can only understand an argument if it's posed in their trade language. This is a rather sad state of affairs, if true. Second, MMT, like any school of thought, is evolving over time and comes from a different tradition. Instead of demanding a model (now! ), why not reach out and try to help formalize some of their ideas. You never know -- you may actually learn something in the process. I could go on, but will stop here for now. There's been much welcome discussion of late concerning the sustainability of government budget deficits and whether the size of the public debt is anything to worry about. I'm not going to answer this question for you here today. But what I would like to do is describe a framework that economists frequently employ to help organize their thinking on the matter. I want to begin with some simple arithmetic and then move on to a bit of theory. I'll let you judge whether the framework has any merit. Let's start with some standard definitions. G(t) = government spending (purchases and transfers) in year t.
T(t) = government tax revenue in year t.
R(t) = gross nominal interest rate on government debt paid in year t+1. D(t) = nominal government debt in year t (including interest-bearing central bank reserves). In words, the left-hand-side (LHS) of the identity measures the money needed to pay for government spending G(t) and the interest expense of the debt [R(t-1) - 1]*D(t-1), where [R(t-1) - 1] denotes the net nominal interest rate. The right-hand-side (RHS) of the identity measures the money collected by the government in the form of taxes T(t) and the money created through new nominal debt issuance [D(t) - D(t-1)]. The LHS of  represents the primary government budget deficit. If the deficit is positive in period t, then the RHS of  tells us that the stock of debt in period t must be larger than the interest plus principal of the debt maturing from period t-1. Assuming d > 0, the identity  tells us that a sustained primary deficit is possible only if R < n. Recall that R represents the (gross) nominal interest rate on government debt and n represents the (gross) rate of growth of the nominal debt. Because of my stationarity assumption d = D(t)/Y(t), it follows that n also represents the (gross) rate of growth of the nominal GDP. A lot of mainstream thinking on the matter of "fiscal sustainability" is rooted, I think, in the assumption that R > n. In the standard DSGE model (which abstracts from financial market frictions), the "real" interest rate R/n is pinned down by time-preference and productivity growth. This real interest rate is typically estimated to be a positive number. If this is the view one adopts, then condition  implies that budget deficits cannot be sustained into the indefinite future. It's not exactly made clear what might happen if deficit finance persists in such a case -- maybe inflation and/or default. Bond vigilantes. Something like that. Secondly, the standard DSGE model ignores the role that U.S. Treasury debt plays as an exchange medium in financial markets. The growth in the demand for Treasury debt has come from many sources over the past few decades. It is used extensively as collateral in credit-derivative and repo markets. Foreign countries have clamored to accumulate U.S. Treasuries as a store of value. Its demand was further enhance as a "flight to safety" asset during the financial crisis. And more recently, changes in financial regulations (Dodd-Frank and Basel III) have further spurred the demand for Treasuries (for example, they can be used to satisfy the Basel III liquidity-coverage-ratio requirement for banks). Some of this discussion seems related to what the MMT folks are talking about. I'm not an expert in that area (am still reading up on it), but see, for example, Scott Fullwiler's article: The Debt Ratio and Sustainable Macroeconomic Policy. There's also this nice piece by (the more mainstream) Neil Mehrotra: Debt Sustainability in a Low Interest Rate World and, of course, Olivier Blanchard's AEA Presidential Address: Public Debt and Low Interest Rates. d = L(R/n), with L increasing in R/n. Now, to discover the limit of how large the deficit can get, imagine that the government wants to maximize the sustainable deficit through its choice of R/n (all that matters here is the ratio). What are the limits to seigniorage revenue? The answer to this question has a standard "Laffer curve" property to it. Increasing R (or decreasing n) is bad because doing so increases the interest expense of the debt. On the other hand, it increases the demand for debt. Think of [1 - R/n] as the tax rate and L(R/n) as the tax base. Increasing R/n has competing effects. So, for example, increasing n has the effect of increasing the inflation tax rate. This is good for revenue purposes. But it also has the effect of decreasing the tax base (as people substitute out of government debt into competing securities). This is bad for revenue purposes. The revenue (primary deficit) maximizing interest/inflation rate equates these two margins. In short, economic behavior places a restriction on how much the government can finance its operations through money/debt issuance. This is a very simple theory and it can be extended in many different and interesting ways. But the point of this blog post was first, to demonstrate how government budget identities can be combined with economic theory to form a meaningful government budget constraint and second, to demonstrate that there's nothing necessarily wrong or unsustainable about a government running a persistent budget deficit. I should have figured that Nick Rowe beat me to this post; see here. 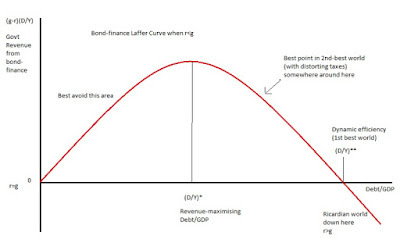 He also provides this nice Laffer curve diagram. In the diagram above, r corresponds to my R and g corresponds to my n. I think I would have drawn the diagram with seigniorage revenue on the y-axis and the real interest rate (R/n) on the x-axis. Then (R/n)* would denote the seigniorage revenue maximizing real yield on government debt. Nick points out that in the OLG model, the introduction of (say) land eliminates the possibility that R < n in equiilbrium. This is true only if government debt serves only as a store of value. My paper with Fernando Martin uses a standard macro model where debt has a liquidity role and coexists with a higher yielding alternative asset. It also has a diagram like Nick's (Figure 1). A final thought. One often hears MMTers say something like "we replace the government budget constraint with an inflation constraint." I interpret this statement in the following way. Imagine setting the nominal interest rate to its lower bound R = 1 (I actually think it can go lower). Then the real rate of return on government debt (zero-interest money) is 1/n. If the real GDP is constant, then n represents the equilibrium inflation rate (in a model where we impose the additional market-clearing restriction). Assuming we are on the LHS of the Laffer curve, increasing the inflation rate increases the primary deficit. An inflation constraint n < n* then limits how large the primary deficit can be. According to my friend and former colleague Steve Williamson, inflation is low in Japan because of the Bank of Japan's policy of keeping its policy rate low. Accordingly, if the BOJ wants to hit its 2% inflation target, it should raise its policy rate and keep it persistently higher. This is what I've called the NeoFisherian proposition. It's a provocative idea because it flies in the face of conventional wisdom. But is it correct? Does it serve as a practical guide for monetary policy? My feeling is that the answers to these questions are "no" and "no." In what follows, I explain why. For simplicity, think of the real rate of interest as the rate of return an investor can achieve by storing goods across time. For squirrels storing nuts, the real rate of interest is negative. For humans planting corn, it is positive. Whatever its value, let's just fix it at some number and assume it remains invariant over time (this is not a critical assumption for the arguments I want to develop below). Then, the Fisher hypothesis is that the nominal rate of interest should move one-for-one with the expected rate of inflation. How does the Fisher equation hold up in the data? Let's just say that the evidence is mixed. Fisher himself famously rejected it as being empirically relevant. But over long periods of time, and also across countries, various nominal interest rates do appear positively correlated with the measured inflation rate (taken as a proxy for expected inflation). Well, correlation is one thing, explanation is another. What is the theoretical underpinning of the Fisher equation? One way to view it is as a no-arbitrage-condition. Suppose that planting a bushel of corn yields 1.02 bushels at harvest (2% real rate of interest). Suppose that the nominal price of corn (its price measured in dollars) is expected to rise 10% by harvest time. What rate of return would an investor demand of a bond promising to deliver money at harvest time? The Fisher equation says that the investor should demand a rate of return of at least 12%. The bond would then deliver 12% more dollars that, if spent on corn at harvest, would leave an inflation-adjusted return of 2%. In this case, the investor would be just indifferent between investing in a corn planting venture and the nominal security. bondholders demand higher interest rate to compensate for higher expected inflation. If the nominal interest rate on money is zero, then money must be held for its non-pecuniary benefits (liquidity). The liquidity premium on money is in this case equal to the nominal interest rate on an illiquid bond; i.e., LP = R = r + π. 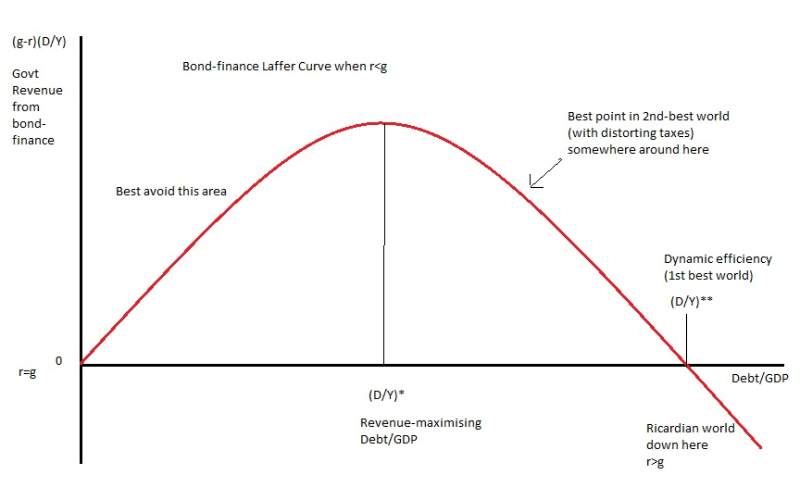 Now, if the nominal security yielding a positive interest rate in the story above consists of government bonds (denominated in the domestic currency), then the only way to explain the apparent discount on government bonds is by appealing to an explicit government policy that renders these bonds illiquid relative to central bank money. And indeed, we see restrictions like this in place throughout history. For example, convenient low-denomination zero-interest notes (cash) versus inconvenient large-denomination notes (bonds) trading at discount. Or consider today, where interest-bearing accounts at the U.S. Treasury are deliberately rendered useless for making payments. Or the Fed's apparent aversion to setting up a repo facility for U.S. Treasury debt in order to enforce a ceiling on its interest rate target path (such a facility would serve to reduce the demand for reserves). Monetary theorists like Neil Wallace have puzzled forever over the phenomenon of why government bonds should trade at a discount (the so-called, coexistence puzzle). Others, like former Minneapolis Fed president Narayana Kocherlakota, have attempted to rationalize policies that render government bonds illiquid; see here. 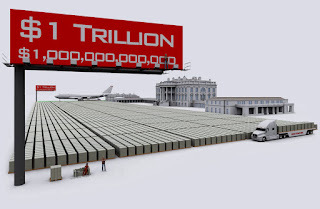 At the end of the day what is true is the following: the nominal interest rate on government bonds is, one way or another, a deliberate policy choice (for governments that issue debt denominated in the money they issue). This goes for default risk as well. There is no reason to default on debt that constitutes a promise to deliver money that one can costlessly produce. If default takes place in such circumstances, it is a policy choice, not an economic necessity. Alright, what does all this have to do with Neo-Fisherism and the Neo-Fisherian proposition? I hope everything will fall together in due course. In the meantime, let's assume that the Fisher equation is sound theoretically and holds approximately well in the data. Would this support the proposition? It's clearly not enough because the proposition has to do with causality. The conventional view outlined above is also consistent with theory and evidence. Moreover, the conventional view as expressed through - provides a simple, coherent, easy-to-understand story for why we'd expect to see a positive correlation between interest rates and inflation in the data. It may not be correct, but at least it's understandable. Can the Neo-Fisherian proposition be explained in a similarly simple and compelling way? I think it's important for ideas to expressed in clear and simple terms. If policymakers are going to take the proposition seriously, the underlying economic mechanisms will have to be explained in a simple and straightforward manner. It will have to resonate with listeners at some level. I've only heard of one mechanism that I find semi-plausible: the idea that a higher policy rate increases the interest expense of government debt which, if not met with a tax increase, must be met by an acceleration in money/bond printing (some empirical evidence here). Alternatively, could it be that an increase in the policy rate serves as a type of cost-push shock that propagates itself forward through some adaptive inflation expectations mechanism? I don't know, but it seems worth exploring. But, what if we turn this idea on its head, and we think of the causation running from the nominal interest rate targeted by the central bank to inflation? This, basically, is what Neo-Fisherism is all about [...] But how would this work? [...] To simplify, think of a world in which there is perfect certainty and where everyone knows what future inflation will be. Then, the nominal interest rate R can be expressed as R = r + π, where r is the real (inflation-adjusted) rate of interest and π is future inflation. Then, suppose that the central bank increases the nominal interest rate R by raising its nominal interest rate target by 1 percent and uses its tools (intervention in financial markets) to sustain this forever. What happens? [...] after a long period of time, the increase in the nominal interest rate will have no effect on r and will be reflected only in a one-for-one increase in the inflation rate, π. In other words, in the long run, the only effect of the nominal interest rate on inflation comes through the Fisher effect; so, if the nominal interest rate went up by 1 percent, so should the inflation rate—in the long run. First, I wonder what "tools and interventions" he has in mind. If the tool involves a sustained increase in the money growth rate, then there's nothing new here--this would just be standard Monetarist reasoning consistent with the textbook explanation - above. But I think he means something else. As I explained above, the "Fisher effect" is a statement about how expected inflation affects the interest rate, not the other way around. The interest rate in Steve's thought experiment is fixed. Therefore, the "Fisher effect" here must relate to the economic force that causes inflation expectations to rise. What is this force? He doesn't say. One is left with the feeling that, well, since the Fisher equation holds in theory (and to Steve, in the data as well), inflation expectations somehow must adjust to make this true. Ergo, raising the interest rate will eventually lead to an increase in inflation. Central bankers need more than this to go on. In any case, I think that the logic is flawed. Let me explain. Let's take the case of Japan. Japan's inflation rate has been close to zero for a long time. Although I do not know why, Japan wants a higher inflation rate. How is to achieve this objective? I laid out my case here: The Failure to Inflate Japan. In a nutshell, the argument is this. Peg the policy rate to zero all along the maturity structure of government debt (the BOJ is doing this);  Grow the nominal debt more rapidly until the desired inflation occurs (the government is not doing this). (i) How does the CB keep R=0 "along the yield curve." How could you have a flat yield curve at zero with positive inflation? (ii) If you're eliminating all taxes and the fiscal authority is financing everything by issuing debt, and the CB is trying to sustain R=0, then something has to give. For example, people start anticipating that fiscal authority can't roll over the debt, default premia rise on the government debt, and CB is forced to increase R to generate the CB profits required to keep the government afloat. Steve has also pointed out that Japan's nominal debt has already grown substantially, so where's the inflation? The answer is that one cannot just look at supply--one must also consider demand. Evidently, the demand for JGBs has been increasing rapidly as well. If the supply had not accommodated this growing demand, Japan may very well have experienced the mother of all deflations (that demand is not observed and has to be inferred from price and quantity is a key weakness in this story). where, in case you forgot, r is real interest rate, π is expected inflation, R is nominal rate on illiquid bond, R_m is nominal rate on liquid bond (including reserves) and LP is a liquidity premium. What then is the effect of raising R_m? Well, it's complicated. Much depends on the structure of fiscal policy (Ricardian vs. Non-Ricardian); see here. In some models, raising R_m leaves r and π unchanged, which implies that the liquidity premium on government money LP falls. Eliminating the liquidity premium on government money/bonds is the famous Friedman rule prescription (convention version sets R_m = 0 and π = -r, but R_m = r + π for any π > 0 also works). But in other models, increasing R_m puts upward pressure on the real rate of interest, reducing the demand for investment, leading to economic contraction with no change in long-run inflation; see here. The point of all this is, IF higher inflation is desired (and I am by no means advocating any such policy), THEN why not keep the policy rate low and use "free lunch" fiscal policies as long as inflation remains below target? Why bother experimenting with the Neo-Fisherian prescription of raising the policy rate that's somehow supposed to make people magically expect higher inflation?